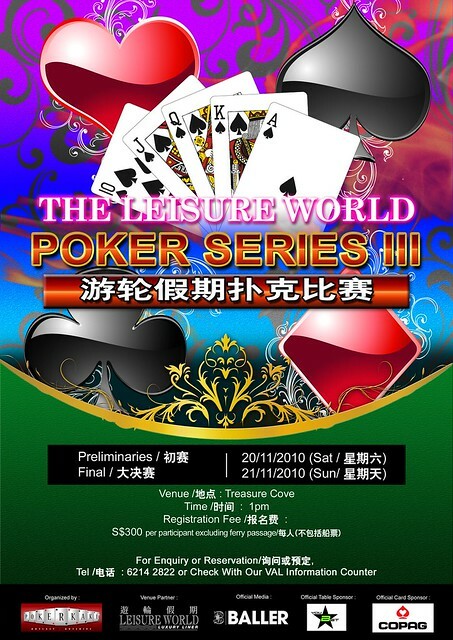 Mark your calendars quick ladies and gents, because LWPS III will be taking place on the 20th and 21st of November, 2010! Get set for another action-filled weekend of MTTs, SnGs, and cash games on board the MV Leisure World. This month, we've made some adjustments to our Main Event structure to give all kakis even better value. Plus, we're introducing a brand new side event (Double Shoot-Out! ), while retaining the uber-value, adrenaline-packed Rebuys event. Remember, we're still awarding seats to the $888 CNY Main Event in February, so you won't just be playing for the lion's share of the prize pool. Most importantly, we've got that lucky draw coming in February, where we'll be giving away 3 seats to the $888 CNY Main Event. All you need to do to in order to qualify for the lucky draw is to have played 7 tournaments from LWPS I to LWPS V (all main events and side events count towards your total!). In addition, we'll be continuing the extremely popular poker players' party on Saturday night. The drinks will be flowing freely from 11pm till midnight, and there's simply no better spot to unwind, relax, and laugh yourself silly with your fellow kakis. As always, the early bird catches the worm. Book your ferry cruise ticket early and you'll get the early bird $60 cabin rate. On top of that, you'll pay only half price if you stay a second night. Last but not least (and we know you're gonna love this one), all $20 extension/overstay charges will be waived! Give those friendly folks at NC Tours a ring now @ 62142822 to grab that early bird promo. Do mention the code PK when booking, so counter staff will know that you''re boarding for the tournaments. Cabin availability is limited so do hurry. The early bird promo closes at 8pm, 12th November, 2010. See you all on board! Format: No-Limit Texas Hold’em +R. Check out the Leisure World FAQ for embarkation info.